There are times in our lives when we cannot see daylight even when all the lights are on. So it is for Pastor J.T. Thomas. 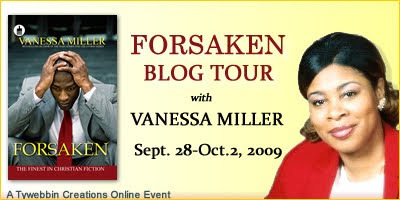 Forsaken by Vanessa Miller brings its readers into the tumultuous life a man of the cloth whose fabric is riddled with holes of his past and current indiscretions. How the couple will handle the hardships of ‘roosters coming home to roost’ is one that will provoke a myriad of emotions. From beginning to end, the manifestation of how we touch others lives is vividly shown. Linda, thank you for blogging about my new book, FORSAKEN, I really appreciate it. Thank you for the opportunity to support you Ms. Vanessa. Linda, I appreciate you introducing your readers to Vanessa Miller this week. Always appreciate your support!